Courtesy of Bruckner Chase, Ocean City Swim Club, New Jersey. 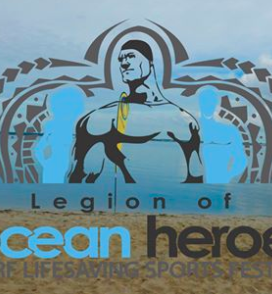 Legion of Ocean Heroes Surf Lifesaving Festival is an event with ocean lifeguards, open water swimmers, triathletes, paddlers and para-athletes of all ages competing across multiple disciplines of surf lifesaving sports. Race director Bruckner Chase explains, "Para-athletes can compete as individuals and in teams with other athletes. Paddle and shorter swim events will be run in heats of 6-12 with top finishers advancing to a final for each event. Heats will be grouped by age and anticipated ability of each athlete. The finals will merge the heat winners from all the different groups. The October 8th event will be held at Beesley's Point Sea Doo, Beesley's Point, New Jersey. Race will include a 0.5-mile ocean swim, 400m prone paddleboard with 10'6" and 12' race boards, 300m surf lifesaving swim, and the Ocean Heroes Challenge (Relay or Solo) that consists of a 300m ocean swim + 400m paddle. All events will accommodate para-athletes." The third annual event will follow International Surf Lifesaving Competition Guidelines. For more information on the Legion of Ocean Heroes 3rd Annual Surf Lifesaving Festival, visit here and on Facebook.